Has Sam Darnold made Jets kings of New York over Eli Manning, Giants? While the clouds continue to hover over East Rutherford, the sun appears to have peeked through in Florham Park. The New York Giants sit at 1-5 and in last place in the NFC East while their aging quarterback struggles. The New York Jets are 3-3 and realistically thinking of the postseason with their promising rookie leading the way. These are two franchises seemingly headed in opposite directions, and their fates can be traced back to the offseason. The decisions that will be debated for decades occurred atop this year’s NFL draft. The Giants passed on a quarterback with the No. 2 overall pick and selected running back Saquon Barkley out of Penn State, in part because they had Eli Manning on the roster. Barkley is proving to be a breathtaking playmaker, no doubt, but his star has been shining in defeat. The Jets happily grabbed quarterback Sam Darnold out of USC with the very next pick. He is proving to be the franchise pillar that they’ve desperately desired for decades. They’re happy with what they’ve received from him this season and even more excited about what the future might hold. Now six weeks into the season, we’re able to see a bit more clearly where these teams stand and the long-term effect these picks will have on each franchise. Does the development of Darnold and decline of Manning keep hammering home the mistake the Giants made in not drafting a quarterback? Until the Giants find a suitable replacement to build their franchise around, yes. It’s the most important position in football by a wide margin. The opportunities were there for them to find their franchise quarterback at No. 2 overall. Instead, they chose a running back. It’s not that Barkley isn’t a sensational player. He is. It’s just that he plays a position that they’re realizing isn’t nearly as vital to winning as quarterback. A look at Eli Manning and Sam Darnold reveals age isn't the only difference. Which team appears to have a stronger foundation on which to build and why? I’d give a slight edge to the Jets, but this is tricky because there’s some projection involved. Let me explain. 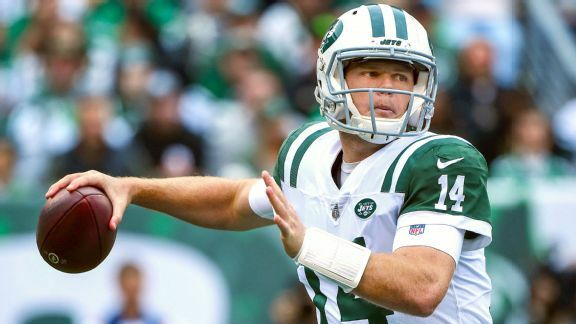 Right now, I’d say the Giants have better talent on paper than the Jets, but Darnold’s presence tilts the scale in the Jets’ favor because we all know the NFL is a quarterback-driven league. This, of course, is based on the belief he will develop into a playoff-caliber quarterback. No one can say for sure after only six games, but he certainly seems to have the traits –- tangible and intangible –- to be that kind of player. And that gives the Jets an edge in the rebuilding process. In terms of non-quarterback talent, the Giants have more blue-chip players than the Jets -- Odell Beckham Jr., Landon Collins and Barkley to name three. Jamal Adams is approaching Collins’ stature, but the Jets don’t have anyone close to Beckham and Barkley. Those are terrific building blocks for the Giants. To complete the puzzle, they need the quarterback, and that could cost them significant assets if they have to trade up in the draft. What should/can the Giants do with Manning in the short term? It’s kind of funny when Shurmur gives a strong vote of confidence to Manning. I mean, really, what are his options? Alex Tanney? Kyle Lauletta? It’s not like he has a Josh McCown on the bench, a capable veteran who can win games.